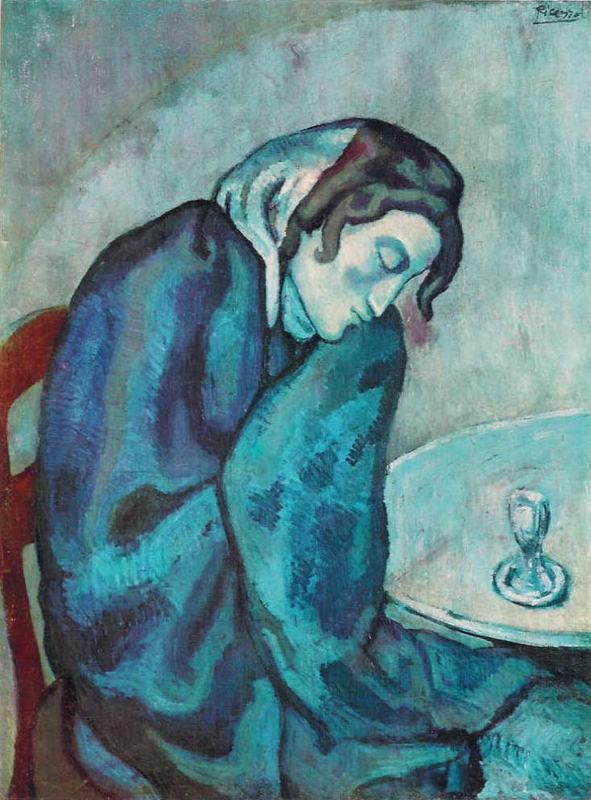 Picasso began the Blue Period with pictures of imprisoned prostitutes suffering from syphilis. What no-one has known, except other artists, is that the series is based on an engraving by Raimondi known as Portrait of Raphael (lower right). Manet had based his first Salon painting on the same small print as shown in Manet's Absinthe Drinker (1859). Picasso knew this. Note how the women wrapped in blankets either sit on a bare bench like Raphael in his toga or have their shadow on the bare wall behind. Raphael was said to be sick in this portrait as these women are too. In Sleeping Drinker, also from 1901, Picasso has eliminated the bench and shadow but included the little pots of paint in Raimondi's etching as a glass of absinthe, just as Manet did in his Absinthe Drinker (1859). The woman, like the others an androgynous representation of Picasso's mind deep in thought, is still wrapped in a blanket like Raphael's toga. 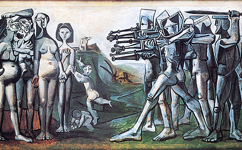 By depicting his mind as a "female artist", Picasso also indicates that the prototypical "model" is the artist because every painter paints himself. 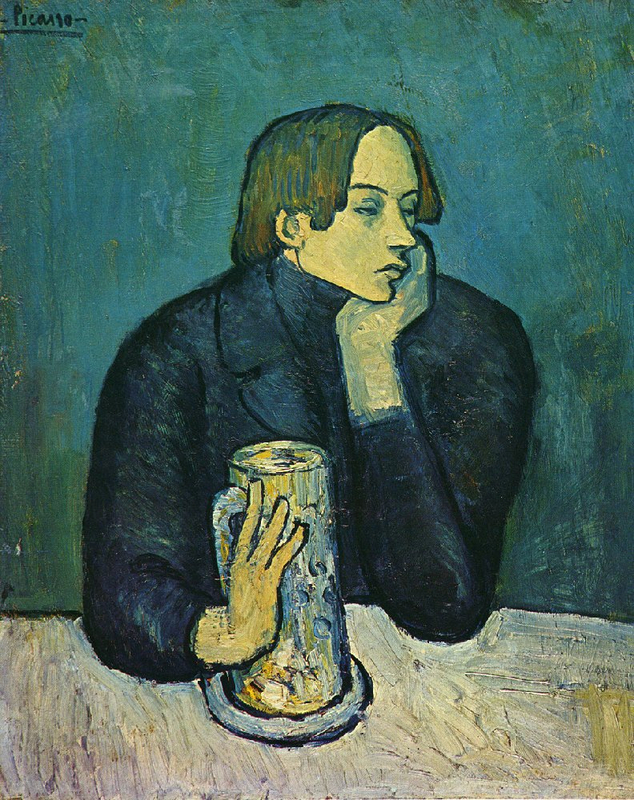 Picasso's portrait of Jaime Sabartes, a poet, uses the same reference to Raphael but replaces the absinthe with beer. The woman has turned into an androgynous male poet. He still represents the "artist" in deep thought like a poet. Alcoholic intoxication fuels his mind while the floppy hand on glass suggests a paintbrush and the glass itself mental reflection. The large, white circular table (in 3 paintings here) represents the artist's "eye", light streaming through: we are behind it, inside his mind. That's why the glass resembles an optic nerve.1 Picasso then pays tribute Manet by forming Sabartes' fingers into an upside-down M. The poet is Picasso/Manet/Raphael. 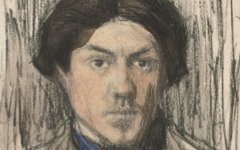 Picasso, Portrait of Jaime Sabartes (1901) Pushkin Museum, Moscow. The Metropolitan Museum's Harlequin is an advance on the same theme. 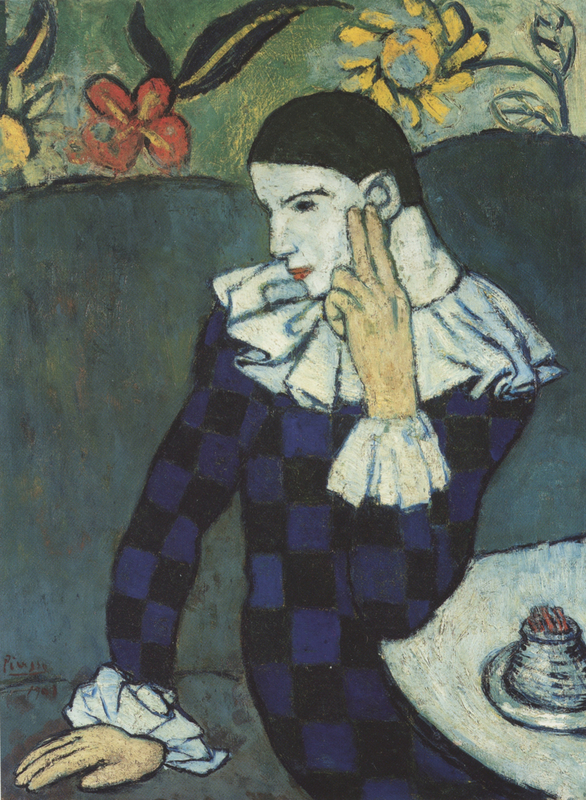 Here the artist-as-Harlequin, an identification accepted by many experts, has his head resting on his hand as a sign of thought with two fingers suggesting a "paintbrush". 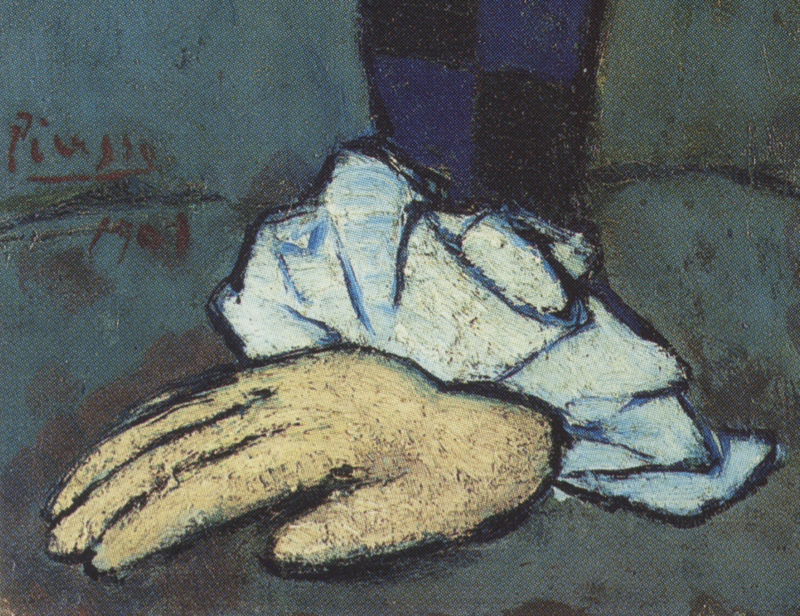 Note how the performer's flesh-colored fingers "paint" over his white face as though it was a brush on canvas prepared with white gesso. Raphael's paint-pots, though, are now an ashtray; tobacco still suggesting an intoxication of the mind. Harlequin's other hand is flat on the seat as though it was the surface of the canvas and, just as the other one "paints" a gessoed "canvas" on his face, this one is on a surface the color of dark, unpainted canvas with his signature in the same color. The hand is "painting" the area blue. The hand's placement where the signature normally goes and the signature's placement above the hand further indicates that this is the active hand of the painter. And, once again, there is an M for Manet, written in blue on his cuff. It has never previously been noted that many of Picasso's Blue Period paintings are based on Marcantonio's Portrait of Raphael. 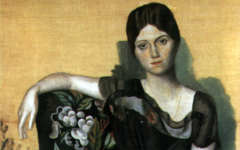 It is a major discovery because it demonstrates that the figures in these paintings are all, in one way or another, a representation of Picasso as Raphael. His initial series of paintings in Paris, known as the Blue Period, depict the mind of an artist in deep thought, conceiving the very images we are looking at. Painted in large part monochromatically, they are images inside the mind, not in nature. Nothing could be more important to demonstrate. Picasso's images are not an abstraction of external nature, a new, revolutionary way of looking at the world, but a depiction of nature inside his own mind. 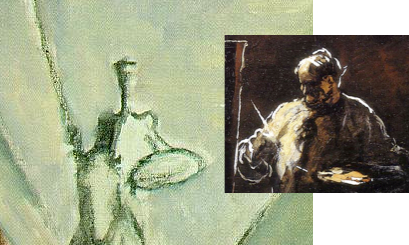 Addendum: To see how Picasso's Blue Period women suffering from syphillis were additionally inspired by Rembrandt's portrait of the syphillitic art theorist Gerard de Lairesse, see Rembrandt's Self-portrait as a Beggar Seated on a Bank (1630). 1. Abrahams, "Picasso's Eyeball"'; Picasso had not yet been to Rome but it seems likely that he had already recognized Michelangelo's anatomical references, including an eye with an optical nerve, on the ceiling of the Sistine Chapel. See also Abrahams, Michelangelo's Art Through Michelangelo's Eyes (2005), Part One, pp. 12-13. Original Publication Date on EPPH: 19 Oct 2011. © Simon Abrahams. Articles on this site are the copyright of Simon Abrahams. To use copyrighted material in print or other media for purposes beyond 'fair use', you must obtain permission from the copyright owner. Websites may link to this page without permission (please do) but may not reproduce the material on their own site without crediting Simon Abrahams and EPPH.